Brown University is accused of filling its two retirement plans with high-cost, poorly performing investment options, allegedly causing participants millions of dollars in losses ( Short v. Brown Univ. , D.R.I., No. 1:17-cv-00318, complaint filed 7/6/17 ). Brown selected and retained as the plans’ investment options funds and annuities that caused the plans to incur far higher administrative fees and expenses relative to their size and complexity, according to a lawsuit filed July 6 in the U.S. District Court for the District of Rhode Island. Rather than consolidating the plans’ many investment options into a core investment lineup, Brown retained duplicative investment options with inferior historical performance than other low-cost available alternatives, the lawsuit alleges. The university has contracted, since at least 2012, with two record keepers for one of its retirement plans. This “inefficient and costly” structure caused participants to pay duplicative, excessive, and unreasonable fees for record-keeping and administrative services, the lawsuit says. The university is aware of the lawsuit and is reviewing it in detail, Brian E. Clark, Brown’s director of news and editorial development, told Bloomberg BNA July 6 via email. “At Brown, we are deeply committed to the well-being of our employees and approach our fiduciary responsibilities in sponsoring retirement plans with the utmost attentiveness,” Clark said. The university has a “strong case to make and will respond as appropriate through the legal process,” he added. As with similar lawsuits filed against other prestigious universities, the new lawsuit targets Brown’s relationship with TIAA as its record keeper and investment fund service provider. In the past year, 15 other prominent colleges have been hit with lawsuits, including Yale, NYU, Vanderbilt, and Cornell, for allegedly allowing their retirement plans to charge excessive administrative fees and retaining too many investment options. 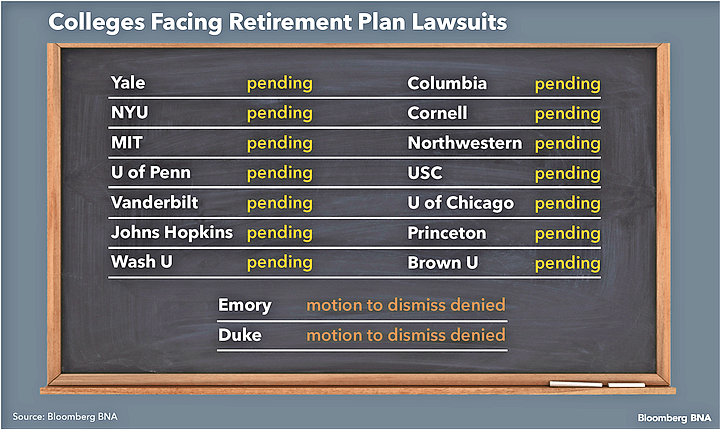 Two lawsuits have seen early success, with judges refusing to dismiss many of the claims against Emory and Duke. Since those rulings in May, three new schools have been targeted: the University of Chicago, Princeton, and WashingtonUniversity. According to the Brown lawsuit, one of university’s retirement plans offered a “bewildering array of 175 investment options” through Fidelity Investments and an additional 24 investment options through TIAA-CREF, which included numerous duplicative investment choices. Brown’s other retirement plan offered 177 investment options through Fidelity and an additional 26 investment funds through TIAA-CREF, the lawsuit says. The inefficiencies of contracting with two providers is underscored by the numerous and duplicative investment choices offered by the plans, the lawsuit says. TIAA has received indirect compensation for record-keeping and administrative services of $3.9 million from only three of its investment options, the lawsuit says. With 13,000 participants in both plans, participants were paying an average of $300 annually for record-keeping services, the lawsuit alleges. The university’s two retirement plans—Legacy Retirement Plan and Deferred Vesting Retirement Plan—had combined assets of more than $1.24 billion and nearly 14,129 participants as of 2015. Schneider Wallace Cottrell Konecky Wotkyns LLP and Sonja L. Deyoe represent the proposed class. Text of the complaint is at http://www.bloomberglaw.com/public/document/Short_et_al_v_Brown_University_in_Providence_in_the_State_of_Rhod/1?doc_id=X1Q6NSLPOF82&imagename=1-1.pdf.